Abstract: We've generally had pretty good experiences with Antec's power supplies around here. Power supplies are one of the most basic building blocks of a computer system, and they are also one of the most important . We've generally had pretty good experiences with Antec's power supplies around here, so today we'll be looking their TruePower 430W model. I'm sure from your perspective a power supply looks like is a pretty bland thing - after all, it's really just a metal box with some circuitry inside that you install once, and forget about. Apart from the odd noisy fan, or a motor seizure which causes overheating, there really isn't much to worry about, or is there? If you like to overclock your computer, a good power supply is the cornerstone. If it can't deliver the right amounts of power at the right moment, you might be stuck with the greatest processor and memory combination the world has ever known, and be unable to do anything great with them. We've seen this first hand through trial and error, but unfortunately most people don't have the necessary equipment to really test out how well a power supply will perform under heavy load. "ATV 12V" is the standard for P4, Athlon XP/MP systems. "ATX 2.03" is an older standard for PIII and AMD K7 processors. 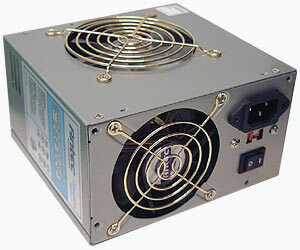 ATX 12V PSU's like the Antec TruePower 430W also support older ATX 2.03 systems. We have seen a few trends which do offer some insight into a power supplies' quality. Build quality speaks volumes for how much engineering has gone into the power supply, and in this case the Antec 430W has a good overal appearance. Peaking through the vents we can see nice sized heatsinks for the internal electronics, and after powering up the unit we are greeted by a nearly silent running unit. The TruePower comes with two extra Molex connectors which also enable it to control the speed of case fans for overall noise reduction. The gold plated fan grills are just for show, and so they aren't worth much mention. 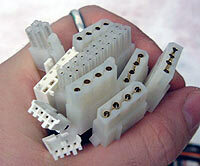 The ATX power cables are sheathed to keep things orderly, and there are a good assortment of molex and FDD power connectors; (5) molex, (2) FDD, (1) 20-pin ATX, (1) 4-pin auxiliary power and (1) 6-pin power connector. The power cables are nice and long which is great for those tall tower cases. For those users there is always the concern of power cables not reaching the lower components.